Are you ready to put your development skills to work for a company that will empower you to come up with creative solutions? If you thrive in a fast-moving environment where collaboration across multiple fields and disciplines is the norm, you could be a great part of our team at Hyperspective Studios as a Senior Developer. Hyperspective is a nimble multimedia firm that lands big projects for amazing clients thanks to a development team that strives for perfection and aims for inventive solutions to complex challenges. We’re a group of innovators that has a hand in everything from web, interactive, and game development to CG animation and film production and we’re looking for ambitious developers to join us in our next great adventure. Looking for full-time employment located at Hyperspective’s main office. 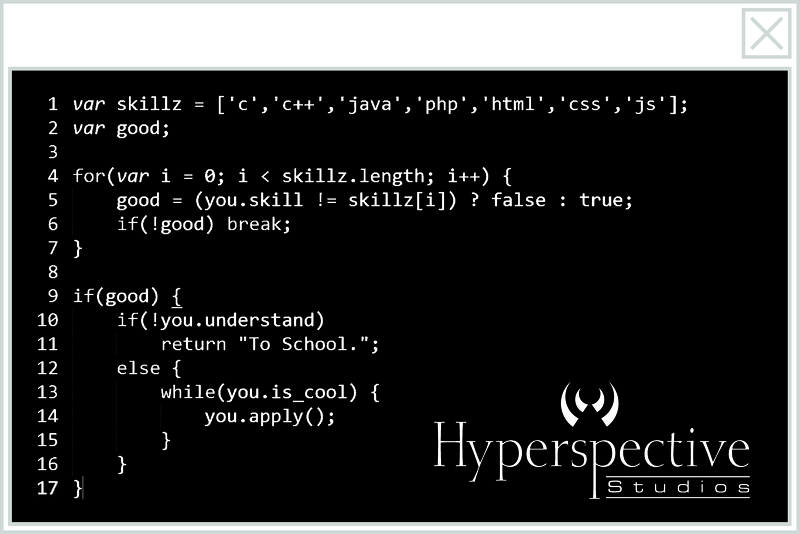 To apply, please send your resume, cover letter and 3 references to jobs@hyperspective.com. © 1996 - 2013, Hyperspective Studios, Inc.